South Texas College’s Starr County Campus Library Art Gallery is showcasing the outstanding talent and creativity of Roma High School art students through is “Annual Roma High School Art Exhibit.” The show features 38 works of art by students who have studied under the tutelage of Roma High School art instructors Monica Gillette, Gabriela Gonzalez and Mario Godinez. The exhibit is on display now through September 9, 2011 at STC’s Starr County Campus Library located at 142 FM 3167, Bldg. F in Rio Grande City. Admission is free and open to the public. 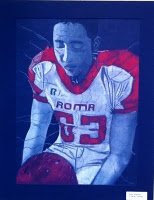 The exhibit features mixed media artwork by freshman, sophomore, junior and senior Roma High School students including Albeza Barrera, Andrea Cab, Damaris Cantu, Miguel Cantu, Ray Castillo, Daisy Delgado, Maria Estrada, Islen Garcia, Jessica Garcia, Jose D. Garcia, Linda Leal Garcia, Michelle Garcia, Uzziel Garcia, Gissel Garza, Isidoro Garza, Juvenal Garza, Ladiza Garza, Alan Gutierrez, Steven Hernandez, Edgar Hinojosa, San Juanita Juarez, Jaqueline Lopez, Aaron Maldonado, Kassandra Martinez, Armando Molina, Jessica Moreno, Jessica Orta, Anayle Zamora del Real, Edgar Rios, Jaslyn Rios, Conchita Rivas, Vivian Rodriguez, Josylyn Sandoval, Paolo Santana and Erika Solis. “Problem cracking,” a pastel on paper drawing by Edgar Hinojosa.